With a focus on female empowerment content and experiences, I'm a Jess-of-all-trades, and yes, I went there. I started my career as a livestream producer. At a time when there was no Facebook Live or Snapchat, I produced big-budget live streamed content for companies like Yahoo, Entertainment Weekly, and most of the major film studios. I covered press junkets, several Comic-Cons, and many, many Twilight and Hunger Games premieres. From there, I transitioned into digital marketing where I managed digital campaigns for clients like Sony Pictures and Paramount. After a short stint in advertising, my career took an unexpected turn into filmmaking. I line-produced a documentary on an extraordinary young woman called A Brave Heart: The Lizzie Velasquez Story. The film went onto receive top honors at 10 major film festivals, qualified for the Oscars, secured worldwide broadcast distribution, and earned two Webby Honorees and a Clio award. My work as a producer also earned me a spot on the 2017 Forbes 30 Under 30 list for Entertainment. I have experience producing events of various scales. In 2016, I produced a 2-day 1,000-women health and wellness summit in Austin, TX for Prevention Magazine. The summit included 4 stages - a mainstage, wellness workshops, cooking demos, and fitness classes, countless brand activations, and over 25 expert speakers. Following that, I produced a conference for 250 female entrepreneurs in Houston called Circular Summit. The speaker lineup included incredible founders and executives like Ali Webb, founder of DryBar, and Jane Wurwand, co-founder of Dermalogica. Most recently, I've been involved with Harness, an organization founded by America Ferrera, Wilmer Valderrama, and Ryan Piers Williams as a way to connect communities through conversation to inspire action and power change. Since joining the organization, I've helped organize two mainstage events of over 700+ artists and activists combined, as well as several smaller gatherings including a livestreamed discussion with Cosmopolitan and Twitter titled #ActivismIRL: Turning Hashtags into Action and a panel for the showrunners of NBC on the topic of representation on television. 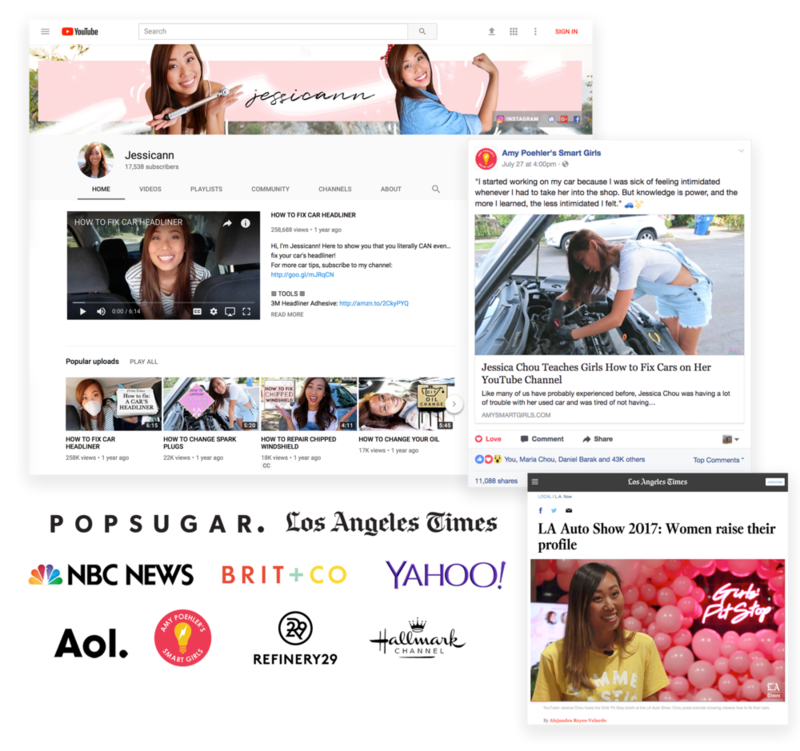 In August 2016, I embarked on my latest journey - a YouTube channel called Jessicann to empower women to learn more about cars. I started the channel to challenge myself to overcome my own fears of looking under the hood of my car. I've since grown the channel to nearly 20,000 subscribers and created and hosted an experience at the LA Auto Show called Girls' Pit Stop two years in a row. I've been featured on Amy Poehler's Smart Girls, Refinery 29, PopSugar, Brit + Co, LA Times, NBC News, Yahoo, and AOL, and am a repeat guest on The Hallmark Channel's Home and Family. My mission is to build Girls' Pit Stop into a well-known resource for women to gain truly useful skills in areas like finance, entrepreneurship, and of course, automotive and other handy skills.